MS Dhoni's 51 off 96 balls during the 1st ODI in Sydney and failing to rotate the strike has brought to focus the rejigging that skipper Virat Kohli and coach Ravi Shastri will have to fret upon. 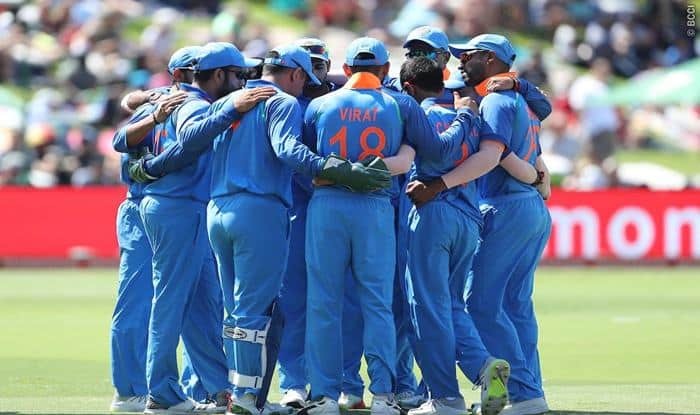 India vs Australia 2nd ODI Adelaide: Former India captain MS Dhoni’s inability to rotate the strike in the middle overs will remain a major cause of concern when India take on Australia in a do-or-die second ODI on Tuesday in their bid to keep the three-match series alive. Hardik Pandya’s sudden suspension on disciplinary grounds has badly affected the balance of India’s batting order, which was apparent during visitor’s 34-run defeat in the opening match despite vice-captain Rohit Sharma’s 22nd hundred in the 50-over format. Dhoni’s 51 off 96 balls and failing to rotate the strike has brought to focus the rejigging that skipper Virat Kohli and coach Ravi Shastri will have to fret upon. With Dhoni being slotted at No 5 even though vice-captain Rohit wants the veteran to bat a notch higher but cues from India’s training session made it clear that the team is unlikely to tinker with the batting order. India’s batting order did come under the spotlight at the Sydney Cricket Ground. The top three (Rohit, Shikhar Dhawan and Kohli) have enjoyed a fairly consistent run since 2016. But it was a rare occasion when Dhoni had to come out in the fourth over of the innings. Dhoni averages 52.95 while batting at number four, which is higher than his current career-average of 50.11 over 333 games. It is even higher than his favoured batting positions of number five (50.70) and six (46.33) but batting lower down the order, strike-rate becomes paramount. Yet, Dhoni’s career strike-rate at number four is 94.21 is higher than his overall career strike-rate of 87.60, or at number five (86.08) and number six (83.23). When India last played ODIs in Australia in January 2016, Dhoni batted at number four in two matches but only scored 18 runs. In fact, since that series, Dhoni has batted at number four in only eight ODIs, with the last instance in the 2018 Asia Cup. He averages 24.75 in this interim, with a strike-rate of 77.34 and a highest of 80 against New Zealand in October 2016. This presents a quandary, which the Indian team management might not be in a mood to sort out at present. Rayudu did well enough in the Asia Cup and in the home series against West Indies, and both batsmen merit a longer run in their respective positions to help settle this batting line-up in the run-up to the English summer. No pre-match short-list has been announced for this second ODI, and all-rounder Vijay Shankar only arrived late Monday afternoon in Adelaide, thus might not be available for selection. In Hardik’s continued absence, any forthcoming changes will be to find a better balance between bat and ball. While India coped in the Asia Cup and against West Indies when he was out injured, playing three spinners in sub-continental conditions helped. In overseas conditions, Pandya’s absence restricts the team’s capability with both bat and ball. Despite his suspect action, Rayudu is free to continue bowling in international cricket, but it remains to be seen if the team management would want him to. Kedar Jadhav provides an alternative option in that light, and he could come into the playing eleven at Dinesh Karthik’s expense. There is every chance that the same bowling composition as in the first ODI will be retained, despite Khaleel Ahmed being off-colour. He batted in the nets alongside Yuzvendra Chahal on Monday. Out of the three fast bowlers, Mohammed Shami was most impressive in the first match and given the delicate situation of this series, he will certainly not be left out. The team management also banks on Ravindra Jadeja’s all-round skills, and as such Chahal’s chances of an immediate return to the side looks doubtful. Mohammed Siraj had a long bowling stint though, under the watchful eyes of coach Ravi Shastri, and he could be in contention for Ahmed’s place. However, onus will be on the top three batsmen to come good once again and deflect any undue pressure on the middle order for a second game running. Kohli averages 73.44 at the Adelaide Oval across all formats, while in ODIs alone, he still averages an impressive 46.66. While he would definitely strive to score runs again at his favourite venue, Dhawan’s form will be in limelight. Along with Dhoni and Rayudu, he is the third batsman in the top six who didn’t play any domestic cricket while the Border-Gavaskar Trophy was being contested. While Dhoni is retired from Test cricket, and Rayudu announced his First-Class retirement before the Ranji season began, Dhawan had no such excuse and spent his time holidaying in Melbourne instead of playing in the 2018-19 Ranji season. While he was in good form before this chosen break, it remains to be seen if his first-ball duck in Sydney was more than a slight blip. Australia didn’t announce their playing eleven for the second ODI either, but it is expected that they will field the same team as in the first match. Their biggest concern at the moment is if Glenn Maxwell is batting at his best position at number seven.